So its been a bit of a day. Running injury, weepy kiddos, and an 18-month old who just learned how to stamp her foot and say “Nnnnnoooooo!” in public. Even now my daughter and the lovely little girl I watch occasionally are upstairs jumping up and down in their cribs just in case I thought they might be sleeping. 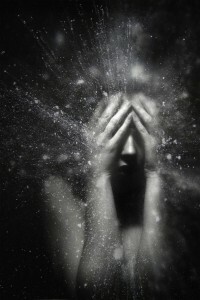 So when I saw this dramatic photograph by Federico Bebber, it really spoke to the kind of fractured stress I’ve been feeling. Federico Bebber‘s work is a little creepier than I usually prefer, but it is perfect for this kind of day. In his artist statement, he says that these images are a result of restlessness caused by discomfort. This guy has my number for sure, and I love that even such dark and frustrating emotions can result in this kind of beautifully detailed and profound work. Buy my book – The Other Side of Silence!